Climbing Kawah Ijen: Deep in the heart of Java, Indonesia, you'll find a hidden wonder that you can't see anywhere else in the world; a sulphur mine where you can witness "the blue flame." I made the journey all the way from Bali to Banyuwangi, and then onto Java, just to witness this world wonder. First, we geared up: scarves, jackets, gloves, headlamps, and oh yes, GAS MASKS. We began climbing up the mountainside to the large crater at the top. In the darkness the stars were like little diamonds, so beautiful my neck hurt the following day from staring up. When you reach the top, you'll see the first flickers of the blue flame down in the crater below. This flame is created by the sulphur mine; they've created piping to trap the steam which then creates the sulphur. As we neared the flame, we were instructed to put the gas masks on. 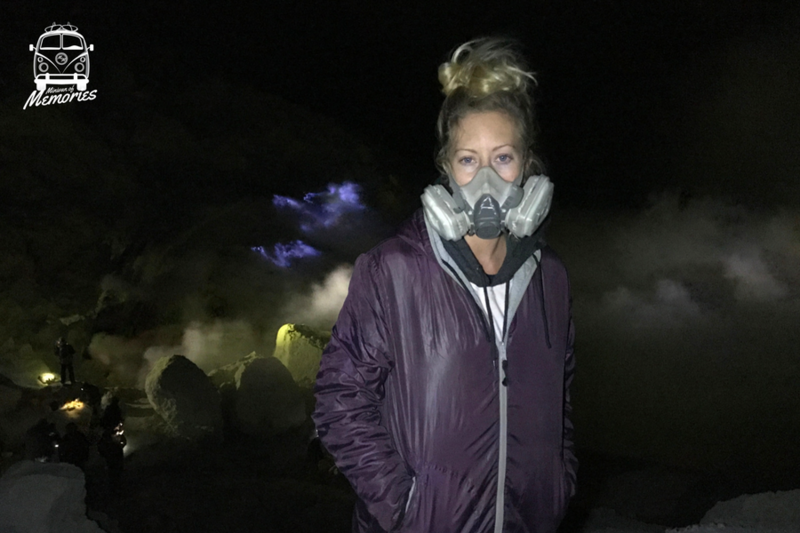 Again, this hike is not for the faint hearted, if a cloud of smoke blows your way- which it will- you need to breathe through your mask, and close your eyes until your guide tells you it's okay to open them. This can be quite scary, because if you do open your eyes, you can get frightened and disoriented by the fact that you can't even see your own hand in front of you. I sat there watching the blue flame until 5am, when the sun started to rise. This was the most beautiful moment of the adventure as I began to see the actual landscape around me. I can only describe it as something other worldly, apocalyptic. At that point most of the other people left, but my group stayed and risked hiking down to the most acidic lake in the world. The blue green water was so beautiful against the neutral colored mountains it was hard to take my eyes off of it. The lake can reach up to 120 degrees fahrenheit, and is needless to say you cannot go in it, and it's clearly not good for your health. I can't tell you how many times I got frustrated, and wanted to give up because I was cold, tired, hungry, and couldn't breathe; but I didn't. It was an experience I'll never forget, definitely in my top 10... and I've seen some magnificent things! Let me just tell you, you will never have a meal that tastes quite as good as the one after climbing Kawah Ijen! This memory belongs to our Passenger Chelsea (@chelseashellyoga) . All the pictures belong to Chelsea's personal archive. To know more about our Passenger @chelseashellyoga, click here.